As we come into the end of Lent, its time to renew our resolutions for the Lord and to draw closer to Him. One way of doing this is by renewing our efforts to love those who are closest to us, and this is best done with the help of prayer. This kind of goes with the traditional connection between prayer, fasting and almsgiving. Let me explain. Prayer is bound to an authentic love of neighbor. Prayer that does not lead into the hearts of others remains immature and is inclined to selfish preoccupation. Love of neighbor without prayer cannot draw strength from God and is inclined to hubris. True prayer informs charitable works for others so that those needs much deeper than the merely material can be met. Such prayer is already in itself a supreme act of charity, a profound experience of mercy. It goes deep into the sufferings of others and suffers with them, even when nothing else seems to be possible to do. Through prayer, sometimes by prayer alone, those in distress discover that they are not alone and that their existence matters. This is because prayer is essentially a movement of divine love, or at least a movement in response to such love, even when that love seems absent. It is also true, however, that sometimes prayer is not enough by itself. Sometimes prayer needs to be expressed in action - and this is especially true for those who do not know they are loved. But prayer is not something purely subjective - it is rather inter-subjective by nature. I mean that prayer involves persons - not only me and God, but me God and neighbor. This is an aspect of prayer that comes in handy as we close in on the end of Lent. 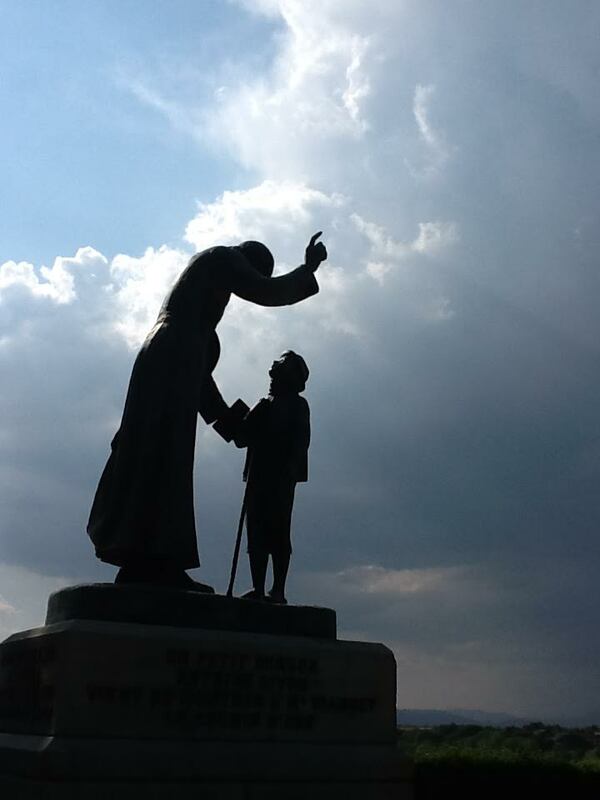 St. John Bosco says it is not enough to love children, children need to know they are loved. What is true of children is also true of about everybody in our life. When we join prayer and love for others together, a question that I like to ask, "Lord, how can I let your love be known." To be honest, the answer is not always clear when I ask the question. But when I find myself in a situation, what needs to be done becomes very clear. It is a matter of being attentive, of being vigilant about what the Lord is doing in a given situation. Recognizing how to be an instrument of God's love for someone is exponentially easier when it involves someone we do not know. When it is someone we know, I find myself not as willing. This might be because people we know expect more from us, especially when we do not feel like giving anything. Quite often when an acquaintance or stranger is involved, their expectations are pretty low. Then, after one has given what one has to give, there is the safe escape. This kind of love, the love we can escape from, is not a great love. Those who are dear to us demand a great love, that is why we do not like letting others get close to us. From those who are bound to us in love, there is no safe escape. The needs of the human heart are infinite and the greater its expectations, the more we will disappoint. Long after our hands are completely empty, I see those whom I love the most need more than I have to give. This is a great place to be. It is the place where God calls us beyond our human limitations and into the greatness of his Love. God the Father wants us to love like the widow Jesus praises. So this characterizes the kind of almsgiving that goes with prayer and love of neighbor. While everyone else gives from the extra they do not need, Christ calls Christians to give out of their own need, like the widow. This means, He commands us to love beyond our human capacity to love. This transforming place is so very painful, but it is also our finest moment, the moment when we are most like God, when we image God perfectly. God the Father stands before us with empty hands because he has given everything to us in his Son. When love demands everything from us, we become the living icon of God the Father - for we too stand before him with empty hands. How do we do this? When we have reached the end of our humanity, beyond which there is nothing more to give, what else can we do but go to prayer? Only through prayer can we go beyond the limits of our self-reliance to rely on the Lord alone. Prayer opens up the possibility of a new kind of love, a supernatural love - which loves beyond what our human nature can give. This is very humbling to experience. To allow this kind of love requires we create room in our hearts, space that can only be created through self-denial. This is where fasting comes into the mix. Here it is not only a fasting from food or abstaining from meat. This kind of fasting also includes fasting from what is comfortable for me to do, allowing myself to be pushed into those uncomfortable sacrifices others need if they are to know they our loved. Such sacrifice is impossible without prayer. When we love with this kind of love, God is in control. It is Him, not us, His power, not ours. That is why our prayer must be constant. Prayer is an act whereby we rely on the Lord and draw our strength from Him, from doing his will. So this is the acseticism I propose for this home stretch of Lent. Today we celebrate the Annunciation -- when Gabriel announced to Mary that she was favored to be the Mother of the Messiah. (see http://tiny.cc/mCylH.) This is the moment when the Word became flesh and dwelt among us. It is also the finest moment of humanity - a moment when one of us was able to say "yes" to God with an undivided heart. Permeating the celebration of this occasion is the very nature of Christian prayer's efficacy. So often we pray for things and are disappointed by the results. It seems like our prayers a re not doing anything, like we wasted our time. I suppose cultural thinkers like Hitchens and Dawkins would say, "Why, in fact, you have." Some people even lose their faith because prayers seem to go unanswered, especially when they have come to God with their anxieties for those they love. Why is it that our prayers do not seem efficacious at times? The efficacy of Christian prayer is based on discovering the will of the Lord through a conversation with Him. In his own mysterious plan there are things that He yearns to give us, only if we ask. One of the problems is that when we pray, we are not usually concerned about what God wants to give. Rather, we are occupied with what we want. This makes for a tough dialogue - especially when what we want and what the Lord wants to give are not the same. Thus, one sure way to begin to pray more effectively is to consider what God wants. This is revealed in the Scriptures. Jesus expressed profound concern that his followers intimately know the Father and, at the same time, share a deep communion with one another. Mystics like Elisabeth of the Trinity see this as the Lord's supreme desire. For example, in the Gospel of John, the night before He died, Jesus offers his great prayer to the Father, "that they may be one as we are one." Now, as we come to understand what this means, it has an impact on our prayer - we have a standard to judge whether what we want is really what God wants. As long as our heart is divided, wanting God but also wanting things he does not want for us, the Lord's ability to answer our prayer is impeded. We are not free to ask for the gift He really desires to give, the gift that is greater than what we think we want. What we want is the lesser thing, and as long as we are attached to that we are not free for what is greater. The greatest thing God yearns to give is his very life and love. Mary seems to have learned this lesson and that is why she is a model of efficacious prayer. The Archeangel who greets her calls her "full of grace." Grace is God's pure gift - a sharing in his very life and love. Mary was full of this life and love when Gabriel spoke to her - and she is even more so now. Because she was filled with this life and love, her heart was undivided. She was free to yearn for what God desired, "Let it be done to me according to your word." No one knows how old this sign really is. It may well go back to the apostles. Jean Danielou discusses its origins in The Bible and the Liturgy. Suffice to say that for Catholics, prayer begins and ends with this sign of blessing. This sign is where one traces the cross from head to gut, from left shoulder to right shoulder while declaring that the blessing is given in the name of the revealed Trinity. This blessing is entrusted to us before our baptism and traced on our foreheads. As a blessing, it confers identity and mission - whenever we make this sign, we renew our awareness of who we are and the great purpose that God has for us. The sign itself recalls what Christ has done for us: he died for us and gave his life for our sakes. The death of Christ for our sakes is a dynamic gift, a supreme value, evoking a response of total faith, of conversion to God. Conversion involves a certain kind of death, and a new kind of life: we must die to what naturally motivates us so that we may be moved by God alone. In addition to the physical sign, we bind ourselves in the name of the Triune God by declaring Him the very source of the blessing. By this declaration, we recall that God has given himself to us, that his very presence lives in our hearts. At the same time, these words recall our baptismal promises. In these promises, we pledge our whole lives to the Father, the Son and the Holy Spirit. This pledge means that we live for the Trinity, that this communion of love has the ultimate call on our existence, that it is the final purpose of our life. Some are a little squeamish over making such a sign - the sign in fact is an act of surrendering to God the whole of our lives. But for most Christians, especially the persecuted and those who are facing death, this sign is an occasion of hope and a source of strength. For them, there is no other sign which is worthy of Christian prayer. It is the sign of their forefathers - of countless men and women who courageously accepted every trial, persecution, rejection, imprisonment, torture and even death. When we make this sign, we also join ourselves to these holy men and women who went before us -- we enjoy a certain solidarity with them in their sacrfice to God. Their complete trust in God all the way to the end helps us to see that God Father, the Son and the Holy Spirit is worthy of the whole of our lives and the depths of our hearts. Thus, we too find the courage to accept this blessing and to stand firm in our faith. In his book, Path to Rome, Hilaire Belloc starts out by criticizing a French proverb that basically asserts that the most important thing about doing anything is getting started. Belloc believes this to be basically false. From his perspective, getting started is easy. Persevering is hard. And this is how he begins his book on his 750 mile walk from France to Rome over the Alps and the Appenines. Belloc's sobering insight goes with something that Antony of the Desert explained in his own teaching on how to live the Christian life. He said that each day we must take up the discipline of the Christian life as if for the first time. Every day is like a new beginning, as if we were beginning to pray for the first time. If we have this attitude, we do not get so discouraged when we fail - for we often will. The Christian life is not one of instant success but rather constant effort, the effort to begin to love because of the love that has been given us. This very effort glorifies the Lord even when it seems like we have utterly failed. The Apostle Paul indicated something like this when he explained that the power of God is made perfect in our weakness. How do we make this new beginning a persevere in it? The secret of course is prayer. Prayer was at the center of Antony's view of the the discipline of the Christian life. It is also the unspoken heart of Belloc's pilgrimage. When we take time to turn our hearts to God in the midst of triumph and tragedy - we find a strength to hang in there, even when we do not feel we can. 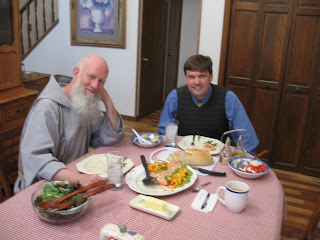 I had the honor of hosting Father Conrad Osterhout at my house on occasion. He has had quite a life as a religious. He has helped form men for the priesthood and religious life. He has been arrested and imprisoned for praying in front of an abortion clinic. He also recieved a special call to live out his Franciscan vocation in an even more radical manner than he had done before - so he joined the Franciscan Friars of the Renewal. Now he lives with his community in New Mexico and comes to Colorado to give parish missions on occasion. It was during one of these visits that he first spoke to me about what the Friars call, "radical fraternity." To support one another in becaming saints, the Franciscan Friars of the Renewal have sought to recover a brotherhood more deeply rooted in Christ. This kind of communion demands humility and patience with one another. It also requires a lot of prayer. But this discipline is also the fertile soil for becoming more authentically human and, thus, a more authentic witness to the power of the Gospel. Elements of Radical Fraternity– an interview with Fr. Conrad Osterhout, C.F.R. I asked Father Conrad what the essential elements of radical fraternity were and what they might mean not only for priests or religious, but also the lay faithful like me. Christ is the foundation. He changes everything. People today speak of their rights, the ability to follow their own way, but in the Gospel and in Christ we find a way of life revealed to transform us. We are called to a humble life, to hold God above all things and follow where He leads. The gift of faith and a life in Christ is to say that my will, my body and my plans are not mine. I use what I have been given, but I surrender it all to Christ, to the Holy Spirit and to God. His truth in my mind allows me to make decisions on those truths. The Holy Spirit guiding me, I can change my plans, my way of thinking, to conform to God. We have to hope for humility if we live in accord with this. Prayer. We search for, and find, Him in prayer. I fulfill my obligations as the ritual; the practice is something alive and connecting to the mystical union. Christ is present in the power of prayer. To quote St. Paul, “It is no longer I who live, but Christ who lives within me.” Each vocation has its demands, but they are all filtered through Christ. I am not enlivened by my will, or my cultural surroundings, but through the true voice of God, the Church, the Holy Spirit. Think on the church. Quo vadis? Remember the church where Peter, as he fled from Roman persecution, stopped? The name of the Church means “where are you going?” If the Lord asks you where you are going, then you are going the wrong way. The sacramental and mystical union we have—‘do this in remembrance of me’. We are told how to love Christ through the covenant. His love is manifest through the covenant and Eucharist. He is offering the tangible reality of his presence in the Eucharist, which is both his humanity and his divinity. If we come to the Eucharist prepared for it, ready to receive the Lord giving himself to us in all our smallness and completing us through Him, we are giving ourselves as he did, prepared to be in service to others. Confession. This, despite the fear we have of it, should be approached with humility as it offers us mercy and renewal. We are able to move forward, to put things in the past and let them stay there and we are totally loved by a merciful Father. He takes us for our weakness and loves us anyway. Over on http://www.Fire.blogtownhall.com I posted a reflection on St. Paul's call to spiritual worship. It involves our bodies into sacrificial offerings to God. The nature of this sacrifice is love. Today, in another interview with Fr. Conrad, he gave me some insight into how this kind of spiritual worship is key to radical fraternity. In our conversation, he relayed to me a comment made by Fr. Groeschel to the Friars. He explained that as he has come into his 70's, he suddenly realized how little he has done for the Lord. He exhorted the Friars to make heroic sacrifices while they are still young. He asserted, "It doesn't get any easier." My mind goes to something that Mother Theresa explained. Namely, one cannot love except at one's own expense. When our love does not really cost us anything, it is not really love. Real love pours out until it hurts. This is what Jesus did for us on the Cross -- it is what St. Paul says we need to do with our lives in return. How is this related to radical fraternal? Radical means to go into the "roots." Radical fraternity goes into the roots of fraternity itself -- and all Christian fellowship is to be rooted in Christ - or its not. When we root our fellowship with one another in Christ, his sacrificial love for us becomes the standard and the source for the way we love one another - a love without measure. Most of us shy away from this kind of life. It demands too much at least for now. We imagine taking it up, later in life, when we are ready. But this is the putting off game. Fr. Groschel's words to the Friars are words we all need to hear -- it doesn't get any easier the longer we wait. We need to make our great sacrifices for God now - while we have the energy and the time to make them. On Saturday, I interviewed Fr. Conrad Osterhout of the Franciscan Friars of the Renewal who is giving a retreat in Boulder, Colorado this week. He and Brother Simon stayed with us after completing another mission in Craig, Colorado. Father Conrad has had decades of experience as a Franciscan, first with the Third Order Regular and later as a Franciscan Friar of the Renewal. I first met Father Conrad at Steubenville. He oversaw the pre-theology program household of which I was a founding member. He later was involved in the pro-life movement and imprisoned in solitary confinement for protesting and counseling at abortion clinics. His stories about those experences are quite profound, and I hope someday to write about those. What I asked him about this time, however, was his spirituality. His answers, a small part are presented here, will be part of a book on prayer that I am preparing. I have always been impressed with the joy, the prayerfulness, the discipline and the poverty of the Franciscan Friars of the Renewal. I once asked Father whether the reason community looked so attractive and was so effective in the ministry was its rediscovery of a more austere form of poverty. Simplicity of life is something they work on together as a community, and they do this in the spirit of Francis of Assisi who himself had a love affair with Lady Poverty. According to Francis' ideal, whatever is not necessary for a friar's apostolic work is renounced for the sake of the Kingdom of God. Following this, the Friars of the Renewal do not own much by way of personal property - basically, the clothes on their back (which mainly includes a very simple habit) and what can be held in a small hand bag, and a toothbrush, if necessary. I suspected that Franciscan joy was the freedom from the anxiety that owning a lot of material things can bring. Father Conrad thought I only had a part of the picture. He explained that he was also first impressed with this freedom from things. He said there was a lot more fluidity and hospitality that living simply made possible. He gave as an example on of his first experiences as a Friar of the Renewal. In his previous religious experience, travel between houses had to be planned, and they were not really set up for taking guests on the spot. This was probably because each house felt responsible to provide proper hospitality to visiting Friars, and spontaneous visits did not help in preparing for this. But as a Franciscan Friar of the Renewal, while he was visiting one of the houses, his brothers asked him to stay the night. He complained that he had not prepared for an overnight stay and thought he should get back to the convent he had come from. His brother asked him simply, "God has provided everything. What else do you need, a toothbrush?" Father Conrad was impressed by this experience. Because of the greater simplicity the Franciscan Friars lived out, he really did not need very much at all. He had all he needed, and he could trust God and his brothers to provide the rest. He discovered an aspect of Lady Poverty's beauty which Francis himself must have also appreciated. Freedom from things allows for a greater freedom to be with one's brothers. This is where Father Conrad shared an important insight about his way of life. The recovery of the Francican Tradition, which the Friars of the Renewal have devoted themselves to, is really a rediscovery of genuine fellowship in the Lord. By placing their fraternity above material comforts, they are rediscovering how to live with one another as brothers in Christ. Father Conrad explaiend that it was not their radical poverty but their radical fraternity which was the true witness of their way of life. The real question their community was committed to answering together was not so much how they could live more simply but how could the simply build one another up in the Lord. By eliminating material distractions, they could begin to work on being more patient with each other. Father Conrad, reflecting on the richness of this experience, quote psalm 133: "Behold, how good and pleasant it is for brothers to dwell together in unity." Teresa of Avila wrote an autobiography (Life or La Vida) which offers powerful descriptions on the life of prayer. I find this work especially suited to those just beginning the spiritual life because it validates so many of those early experiences that one questions at first. The first nine chapters are about her life - up to the time of her conversion. In chapter nine, she speaks about a definitive experience, one that set her in a direction from which there would be no turning back. By this stage of her life, she was a middle aged nun living a mediocre prayer life and motivated a little more by her desire for friendship and to impress others than she was her love of God. On her way to chapel to pray the psalms with her community, she was thinking about this very thing, and felt disturbed by it. That is when "it" happened. She glanced at a statue and the statue seemed to be staring back at her. She experienced the look of Jesus through the eyes of the statue. The statue itself depicted Jesus as he stood before Pontius Pilate - scourged for our offenses, beaten and mocked in a purple robe and a crown of thorns. She was not looking at her with disappointment or anger - a look she thought she deserved. Instead, he was gazing at her in love. His gaze of love pierced her to the heart and she fell on her knees and began to cry. What she experienced was a gift. The ancients called it "the gift of tears." It is really a gift of prayer. This experience was so strong she will go on to develop a description of growth in prayer in terms of these kind of tears. She descibes prayer in terms of watering a garden. The garden is that place in our hearts where we encounter Christ and she explains we must cultivater virtues there so that this encounter will be more beautiful. The water she has in mind is the gift of tears. There are four ways she experienced this gift. For her, each of the ways marked another stage in her growth of prayer. The first way of prayer she describes in terms of drawing water from a well. One draws this water by thinking about one's life and the life of Christ. In thinking about the life of Christ, she refers to a practice the Society of Jesus identifies as composition of place - imagining oneself in various scenes from the Scriptures. Honestly looking at one's life and thinking about Christ for long periods of time (she recommends two hours a day - but thirty minutes is a good start) is hard work, takes determination, perseverance and confidence in the Lord. The second way of prayer is to use a windlass to pump the water out of the well. This kind of prayer is an awareness of a quieting presence of God in the soul. She calls it Prayer of Quiet. This prayer does not take as much effort. In fact, it cannot be forced because the soul does not do it as much as simply recieve it. Spiritual theologians well say that the difference between the first and the second kinds of prayer is that one is ascetical - a cooperation with God's grace, while the other is mystical - the operation of God's grace which the soul can produce but can only sanction. The other two kinds of prayer are also mystical- intensifications of this quiet experience. They are called the sleep of the faculties and the prayer of union. The former she describes as a canal or river that flows through the soul. This flow is so great that the soul experiences the urge to break forth in praise and jubilation. The prayer of union she likens to a gentle rain storm and it involves the total surrender of one's will to God. Seeing prayer in this way is directly related to her experience on the way to chapel. For her there is a primacy of grace. Because the Lord breaks into our lives and pierces our hearts, we find the motivation to be determined in the beginning and to become more and more open as we mature. Her whole teaching on prayer is centered on this encounter, a true encounter with Christ crucified - Risen from the Dead.